“Seed – The Untold Story” celebrates Austrian and German premieres! 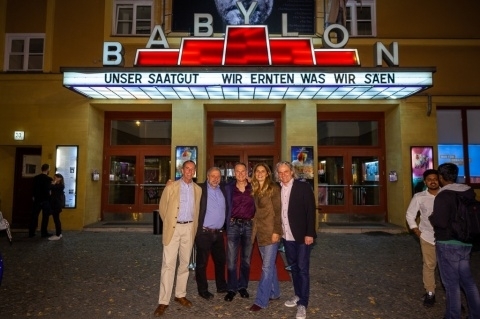 On 10 October 2018 in Vienna and on 13 October 2018 in Berlin “Seed” was premiered to enthusiastic audiences with lively discussions after the screenings. Alone in Germany “Seed” is playing in more than 90 cinemas countrywide. The once abundant seed diversity, a precious gift of nature, was painstakingly created by ancient farmers and gardeners over countless millennia. But today our seeds are in grave danger. In less than a century of industrial agriculture, seed diversity has been drastically winnowed down to a handful of mass-produced varieties. At the premiere in Berlin, director Taggart Siegel, who had flown in specially for the premieres, explained that 94% of seed varieties have disappeared, and so seeds are as endangered as a panda or polar bear; that’s why he and Jon Betz felt that they just had to make the film. We wish the film the best of luck for its theatrical release in Germany and Austria!